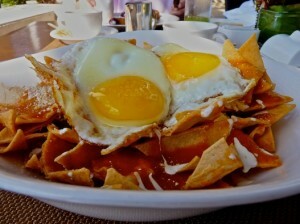 As promised, this is the third submission in the breakfast on the Mayan Riviera “series”. Check out the submissions featuring the Esencia and Maroma Orient Express. More to come so stay tuned. 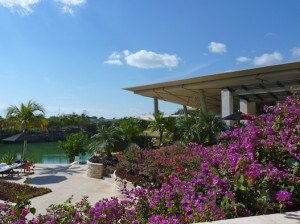 The Mayakoba development is situated about 10 km north of Playa del Carmen. It is a large resort property built among mangroves, forest, luxury golf courses and a beautiful beach that seems to never end. The large Mayakoba entrance is well marked and you will recognize it by the wide white wall structure housing a security booth and a guard screening entries into the property. Mayakoba is home to two of the most beautiful hotels on the Mayan Riviera: the Rosewood and the Banyan Tree. 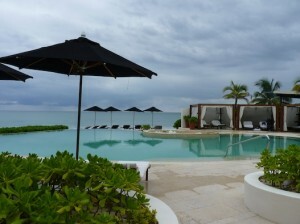 The Mayakoba beach, stretched in front of a few resorts, is a wonderful long beach with pure white sand and great surf. Beach walking, shell hunting (find them but leave them on the beach) or a swim (if it’s calm) are fun to do after breakfast at one of these lovely luxury hotels. Once through the Mayakoba gate turn left and watch for the small Rosewood sign directing you to a narrow lane winding through the dense but manicured forest ending at the reception. Leave your car with the valet and let them know you have come for breakfast. There is no charge for parking but leave gratuities when they bring back your vehicle upon departure. The Rosewood is a sister resort to Las Ventanas al Paraiso (Windows to Paradise) in Cabo San Lucas and is every bit as glamorous. 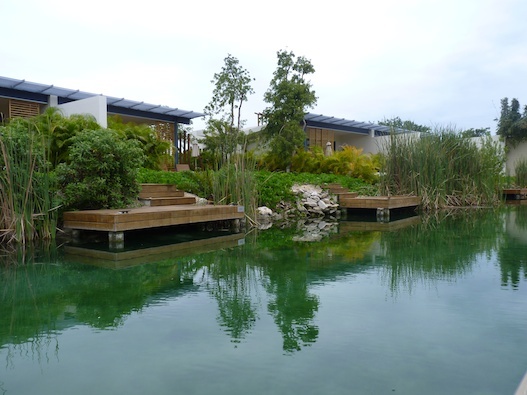 The hotel is situated around winding lagoons among mangroves and an electric powered boat will deliver you to your individual suite on the beautifully landscaped property. Sometimes a little crocodile can be viewed sunning itself on the edge of the water, observing the scene. Nothing to worry about though. The lagoons are regularly monitored for wildlife in this beautiful natural ecosystem and when necessary, the little crocs are moved to another, more remote location. Look out for special fowl that call the mangrove home. The Rosewood is nestled in this natural setting seemingly without disturbing it, blending nature and structure in perfect harmony. The open air architecture merging stone, glass, water and air, the large pots filled with blossoming bougainvillea, giant cactuses and the gorgeous landscape make this place a true paradise. Reservations are not required for breakfast but I recommend calling anyway to avoid surprises and it makes it easier to get through the entrance gate. The security guards are sometimes reluctant to let you through without reservations but just talk them through it. If you are visiting between Christmas and New Year’s the hotel may not accept outside guests. Breakfast is served in Casa de Lago, set near the front lagoon and main pool. You could sit inside but the covered porch is where we like to settle for breakfast. A beautiful buffet is set out inside with all the breakfast side offerings, from fruits to cereals, yogurts, pastries and cheeses, but you choose your main breakfast dish from a menu (included in the price of breakfast). The breakfast main course menu features an enticing selection of Mexican specialties including juevos revueltos (divorced eggs), chilaquilles, juevos rancheros and the more international selection of pancakes, waffles and French toast. You will not be disappointed with any of these choices. 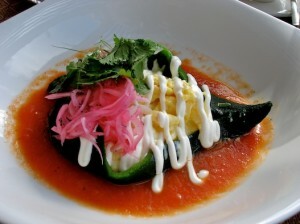 My favorite breakfast entree is the roasted poblano pepper stuffed with scrambled eggs and served over a light tomato sauce. A drizzle of crema and a little pickled red onions add colour and flavour to this perfect creation. A selection of fresh juices is also part of the breakfast experience at the Rosewood. Try the green one, with chaya and pineapple. It’s full of flavour and packed with nutrients. After breakfast settle with a cup of coffee or select one of the teas they offer and linger a bit before heading to the beach. To get to the beach catch a ride in a “chauffeur” driven golf cart (located at the front, behind the reception, where you drop off your car). At the end of the beach walk return for lunch at the Punta Bonita, the Rosewood beachside restaurant by the beach pool. Catch a ride back to the reception in one of the golf carts but before getting back to your car check out the store near the main building for fabulous jewelry by IDE, a local artist with a store in Playa on 5th Ave north, and for Helen Kaminski’s famous straw hats. If you like the Pineda Covalin silks, from cover-ups to scarves, you will find them here as well. I should mention the wonderful Rosewood spa, but look for a full report on spas in another series of upcoming submissions on spas.